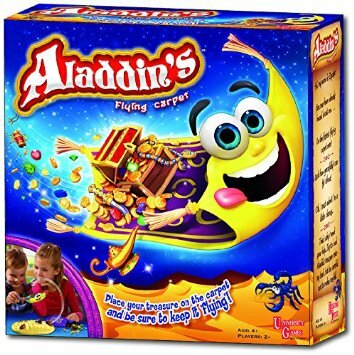 A recent addition to our games collection is that of Aladdin’s Flying Carpet. We have reviewed several products from the University Games range and the boys were keen to put this one to the test when it arrived. The game is easily set up and play started less than five minutes after the postman had been with our parcel. Once set up, the magic carpet is ‘flying’ in mid air as the wire below anchors it down while the magnet above holds it suspended in the air. 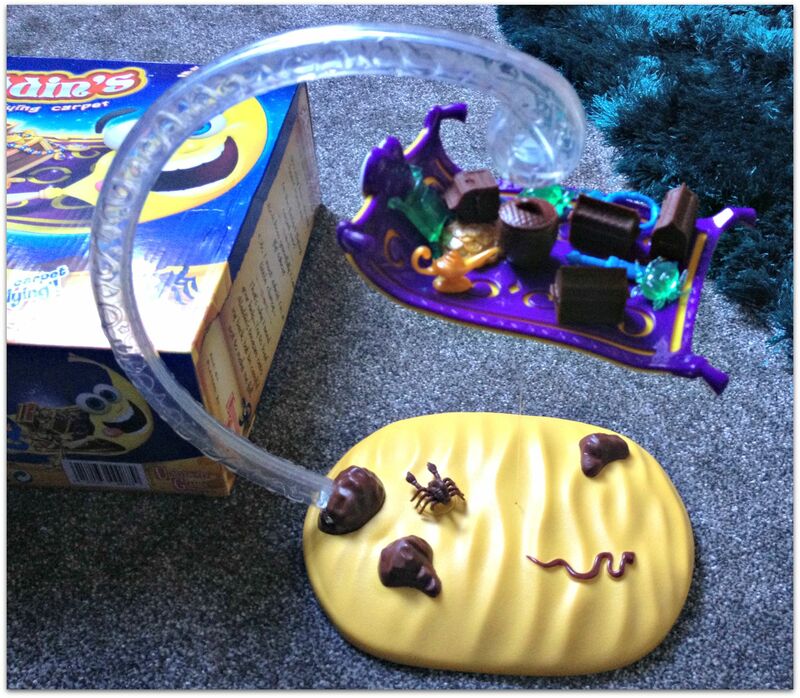 It is quite tricky to get the length of the wire just right; it can be too short and not hold very many pieces of treasure at all (or just not hold up at all) or it can be too close to the magnet above and just stick to it, meaning the game cannot be played properly. Once you’ve sussed out that bit though you’re ready for the off. To play, each player takes their turn to choose one piece of treasure from the bag (no peeking!) and place it carefully on the flying carpet. One too many will make the carpet fall though, and the game will be over! The boys enjoyed this game and played five or six times before they moved onto something else, which I thought was quite good. We found that sometimes it only took a handful of pieces of treasure to weigh down the carpet, and other times it held almost all the pieces. Once it even held every last piece which pleased the boys greatly, but made me wonder whether I’d set it up right! The best price I found Aladdin’s Flying Carpet available for was on Amazon for £18.00. I think it would make a great gift for a young child, and I agree that the recommended age for this game is four years and over – any younger and I don’t think children would grasp the importance of balancing the treasure and games would be pretty short. This is a great game to get kids thinking about strategy, magnetism and balance. My five year old picked up very quickly that you can’t just put pieces anywhere on the carpet after a few turns, and he rapidly changed his approach to the game. The game presented us with a great opportunity to talk about magnets too, and games that go hand in hand with education tend to get my vote. *Take the time to get the length of the wire just right to avoid disappointed faces after ten seconds of gameplay. *Always count the pieces of treasure back into the bag – when the carpet falls it’s amazing how far those little pieces can travel. *We were sent Aladdin’s Flying Carpet for the purpose of an honest and thorough review. This post contains affiliate links for your convenience.